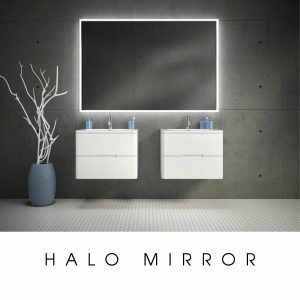 Posted February 17, 2017 by Norburn Lighting and Bath Centre & filed under Bathroom Lighting, Tips and Advice . 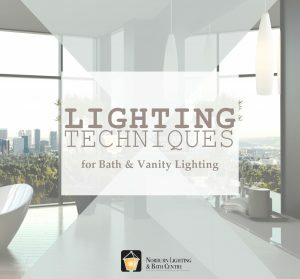 Keep these tips in mind when you purchase bath or vanity lighting to help elevate the look of your bathroom. 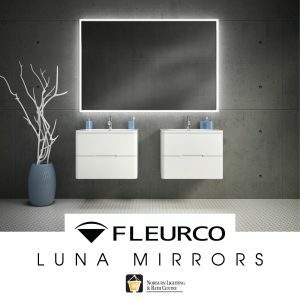 For ideal lighting for grooming, or applying makeup, place sconces on either side of the mirror. This helps eliminate shadows on your face. Ideally, they will be placed 28”- 40” apart and roughly at eye level or centered 66” above the floor. This will vary depending on your mirror size. 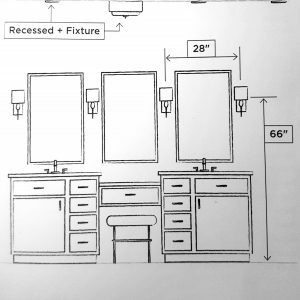 If you don’t have enough space to mount sconces on each side of the mirrors; place vanity lights above each sink. Include some recessed down lights in areas larger than 100 square feet. 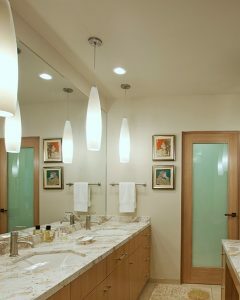 You can also use close to ceiling fixtures to supplement sconce lighting. Don’t forget to have some fun with lighting too! 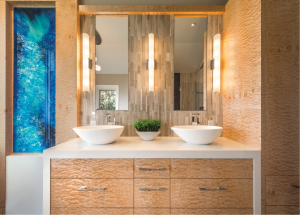 If you don’t want to mount lighting on your mirror consider using pendants to add some visual interest while still being very functional. 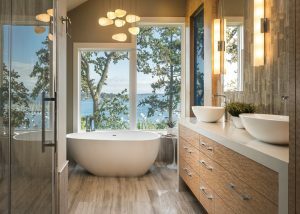 You can also add some flair by adding pendants or chandelier above your tub. 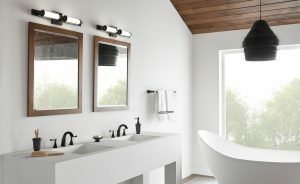 When you’re ready to take your bathroom design to the next level, be sure to visit Norburn Lighting & Bath Centre. Our expert staff will help you determine your lighting needs, finding you the right lighting for your bathroom. Don’t forget we have you covered on all your plumbing needs too! Stop in today and we will help you create your dream space. Posted January 13, 2017 by Norburn Lighting and Bath Centre & filed under Bath Accessories . 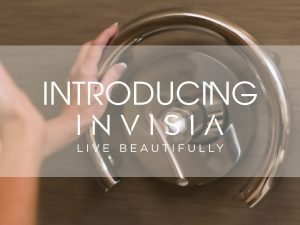 We are so excited to start carrying Invisia Bathroom Accessories in our showroom, that are not only luxurious but also designed with safety in mind. These accessories exude elegance and help create a spa-like sanctuary right in your home. The Serenaseat can be folded to enhance space when it is not in use, and has a removal back rest for easy clean up in the bathroom. The seat is made of durable bamboo; designed to be hypoallergenic, moisture and temperature resistant, and eliminates the growth of bacteria. The framing is also made with durable aluminum material in a powder grey finish, and is rust resistant as well. The Accent Ring frames shower valves and provides support when bathing, or getting in and out of the bath or shower. The Accent Ring is available in a polished chrome finish, and is a top selling product from Invisia. The Accent Bar offers flexibility in terms of installation and placement to satisfy the desired level of support needed, and is also available in a polished chrome finish. The Corner Shelf and Shampoo Shelf helps declutter the shower by providing an accessible space for hygienic products, but can also be used for support. Both have a removal tray made of non-porous material to prevent the growth of mold and bacteria. The trays are also shatterproof, making it a durable piece that will withstand the test of time. These shelving products are available in a polished chrome finish. The Soap Dish, Towel Bar, and Toilet Roll Holder also provide a touch of luxury and functionality to a bathroom. 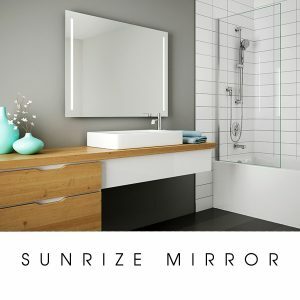 These accessories are designed to provide support when moving around and the polished chrome finish and seamless silhouettes help modernize the look of a bathroom. When you are ready to turn your bathroom into a spa sanctuary, and want to learn more about the new Invisia products, contact our showroom, our Specialist are happy to help you!